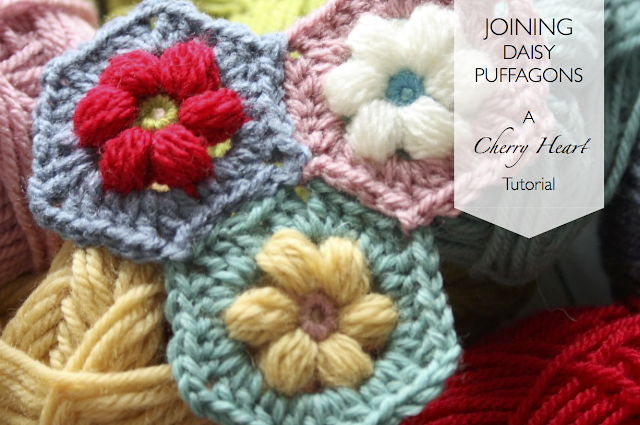 Please refer to the 'Daisy Puffagon Tutorial' for details of how to make the basic Daisy Puffagons. To join these puffy flowers as you make them, we just need to make a slight alteration to the way we complete the last round. So, follow the instructions for making your Puffagon until you have completed 'ROUND TWO'. Join the new yarn and follow the instructions for 'ROUND THREE' until you have made the first 2 treble crochets of the second corner. It should look like the picture above on the right. You will need to make 1 chain and then we will be ready to join the puff. Instead of making a second chain to make the corner space, we are now going to make a 'joining slip stitch' into the puff we want to join to. To do that, put your hook into the corner space of another hexagon, wrap the yarn over the hook and pull it through the corner space and the loop on the hook to complete the stitch stitch. I like to pull the yarn slightly, just to make sure the join is nice and tight. Now you are ready to make another 'joining slip stitch' into the next corner space of the puff you are joining to. Do this in the same way, putting your hook into the corner space of the other hexagon, wrapping the yarn and pulling it through both the corner space and the loop on the hook. Pull the yarn gently to make the join nice and neat. NOTE: If you are just joining to one puff, you can now just make 1 chain and 2 tr's into the same space to complete the corner and then carry on with the rest of 'ROUND THREE' to complete the puffagon. To do that, we now make a second 'joining slip stitch' into the first corner space of the second puff. Make the stitch in the same way as described before, putting your hook into the corner space of the second puff, wrapping the yarn and pulling through the space and the loop on the hook. Pull up snug. To make the final join, make a 'joining slip stitch' into the next corner space of the second puff and pull it up snuggly. Now you can chain 1 to complete the chain space of the corner and then continue working 'ROUND THREE' to finish the puff. Now you know how to join to one or twos puffs at a time, I think you'll be able to see how to go about joining to three or even four puffs as you need to. The theory is the same, all you need to do is continue joining at the corners (substituting the 2 corner chains for 'joining slip stitches' as you need to) until you have worked your way around all the puffs you need to join and then finish the rest of 'ROUND THREE' to complete the puff. I hope this helps you with all your 'puffy' projects and don't forget, for easy reference you can find the written instructions for the pattern at the bottom of the 'Daisy Puffagon Tutorial'. 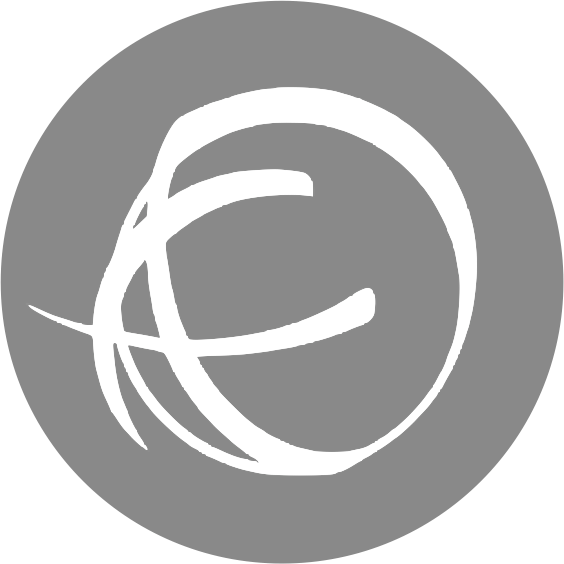 As before, if you have any questions or project picture you want to share (yes please!) - come over to Cherry Heart's Cozy Corner, my Ravelry group. I'd love to see you there.